Jackie Floyd (’07) accomplished a lot in her first few years after graduating from Truman with degrees in theatre and English. While spending a year as part of a music ministry team, she toured Southeast Asia and the western United States. She followed that up with time as a resident director at Rockhurst University while she earned a master’s degree in theatre from the University of Missouri-Kansas City. After obtaining a teaching certificate from Avila University, she moved half-way around the world to teach high school English in the United Arab Emirates. A message from her sister, Kelli (Floyd) Kent (’05), would turn out to make her next few years just as busy. Within a month of that initial text message, the sisters had submitted an application for the Columbia/Jefferson City territory. 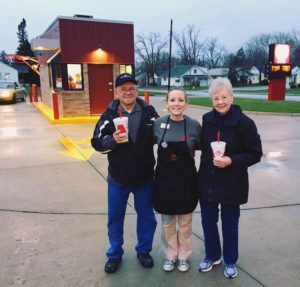 Since opening their first store in Columbia, they have been rapidly building a Smoothie King empire, which now includes a food truck, along with stores in Jefferson City, West Des Moines and Waukee, Iowa, and their hometown of Kirksville. Floyd and Kent show no signs of slowing down any time soon. They have plans to open 11 stores, and they are currently working on locations in Ankeny, Iowa, and another in Columbia. “We love working together as a team, building a successful business that provides job opportunities for many people, as well as a great product to our guests,” Floyd said. As a budding entrepreneur, Floyd still continues to stay connected to the arts. She is active in community theatre in the Columbia area and uses it as a way to make new friends. Even though her degrees are not directly associated with her current career path, she values the skills she picked up in the classroom. Jackie Floyd (’07) celebrates the opening of the Smoothie King in Kirksville with her grandparents. This entry was posted on June 14, 2017 by tmiles. 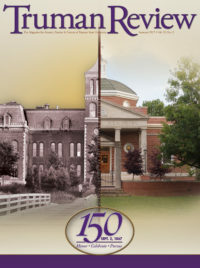 Homecoming 2017: Celebrating 150 Years! Are You an Alumni Chapter Member?